Want cinnamon rolls in just an hour? Yeah, me too. Luckily, that’s possible! Last week I came across the recipe for Quick and Easy Cinnamon Rolls. It featured a dough leavened with baking powder and salt, rather than risen by yeast as most cinnamon roll recipes are. I’ve missed making brunch on the weekend but my time recently has been at a premium, so I figured, why not try it? I should note that this recipe has no eggs in it. I thought the dough sounded a little bland, so I added a teaspoon of vanilla extract to give it extra flavor. I consulted some cinnamon roll recipes that I’d made in the past, and decided that the filling for these took entirely too much butter. I unwittingly omitted granulated sugar from the filling, but it turned out fine without it; I think there would have been altogether too much filling with it. I think I’ve made it better. These take about an hour to make, from start to table. These were better than I expected. I handled the dough very little so little gluten developed, thus the cinnamon rolls were fall-apart tender rather than pull-apart flaky like yeast doughs are. I actually had trouble removing them from the pan because they would crumble. They were ever-so-slightly biscuit-like. The dough was buttery since I used margarine, and I encourage you to use it too instead of shortening for that very reason. I might cut back on the salt slightly next time. Remember that there is no sugar in the dough, so you definitely need the frosting on top of the rolls. I’m glad I cut back on the sugar in the filling, even though it was an accident, because it was nice to have a cinnamon roll that wasn’t incredibly gooey and too sweet. That said, I may try using a little more brown sugar and cinnamon in my filling next time, but it won’t be as easy to roll up. These held up rather well as leftovers – they were great reheated the next day, still moist and tender. Like I said, they didn’t brown, but I think they would have overcooked in my pan if they had; they also would not have been as good on the second day. This doesn’t replace homemade yeast-risen cinnamon rolls, but this cinnamon roll adaptation is great for those mornings where you suddenly realize that you want cinnamon rolls for breakfast. Since these rolls were so tender, this recipe might just grow on me. Want more cinnamon rolls somehow? 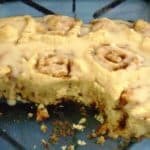 You can try these cinnamon rolls adapted from the The Bread Baker’s Apprentice (affiliate link); these cinnamon rolls adapted from Smitten Kitchen; these overnight cinnamon rolls adapted from Alton Brown; or these gluten-free cinnamon rolls if you need to make something gluten-free. 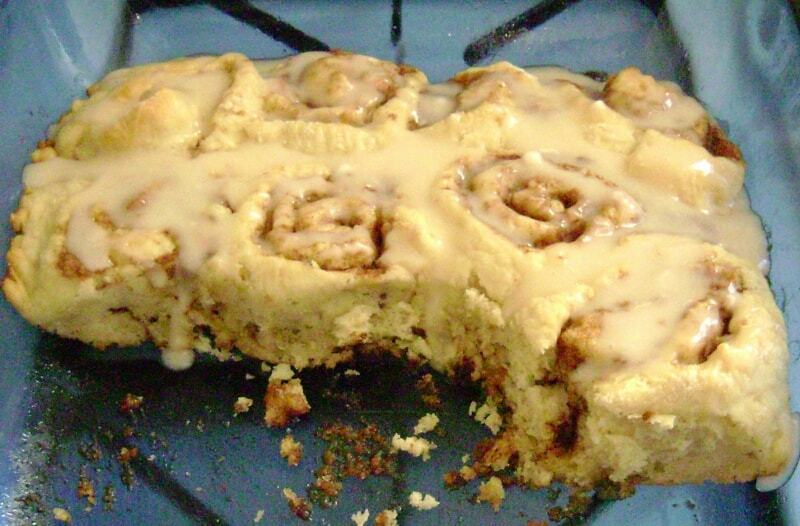 Easy and quick recipe for very tender cinnamon rolls. Made from scratch, they're ready in just an hour! Combine flour, baking powder, and salt. Use pastry cutter to cut in margarine or shortening. Add milk and vanilla and stir until moistened. Turn out onto floured surface. Roll out to roughly 16 x 12 inch rectangle. (This is as thin as I could make the dough without it tearing too much - plus it's as much as I can roll it out and still have it fit on my pastry cloth.) Consider dusting the top of the dough with flour and covering it with plastic wrap to aid you as you roll it out. Spread very soft butter over the dough; it must be very soft (or a butter spread), or else it may catch and tear the dough. Combine sugar and cinnamon and sprinkle on the buttered dough, leaving 1/2 inch border along the edges. You can use extra cinnamon and brown sugar if desired. Carefully roll up the dough. Cut into 1-inch slices and place, cut side up, in greased (glass) 9 x 13 inch pan. Bake at 375F for 25 minutes, or until done. I made sure a toothpick inserted into the rolls came out clean. My rolls barely began to brown along the edges.